The Phillies Nation Top 100 continues today with #9. Our mission is to assess the Top 100 Phillies players of all time using impact to the Phillies, individual achievement, team achievement, traditional stats, and analytics as our criteria. The list was compiled by Ian Riccaboni and Pat Gallen with input from the rest of the Phillies Nation staff. Please check back tomorrow morning for #8. Signature Season: Led the league in PA, AB, runs, and triples in 2007 with .296/.344/.531 line with 30 HR and 41 SB en route to winning the 2007 MVP after proclaiming in Spring Training the Phillies were the “team to beat” in Spring Training. The word swagger, and in turn, its slang equivalent “swag”, has been around for years and is defined by Merriam Webster as “a very confident and typically arrogant or aggressive gait or manner.” It is often associated with persons who exhibit a certain savoir-faire, a confidence exhibited when one knows exactly what to do. Some times someone with swagger often can have savoir-faire but the two are often mistaken for each other. 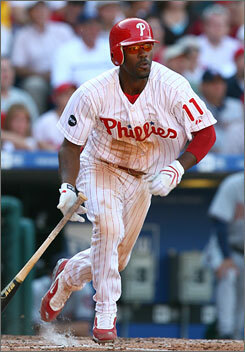 In Spring Training 2007, Jimmy Rollins displayed both. “”I think we are the team to beat in the NL East — finally. But that’s only on paper,” Rollins told reporters. How right he would be. The Atlanta Braves stranglehold of the NL East was finally broken in 2006 by the New York Mets. The Mets finished 12 games ahead of the second-place Phillies, the Phillies just three behind the Wild Card-winning Dodgers. As spring brings hope eternal, statements like the one Rollins made usually come and go, particularly when they are targeted at a team that was just a few outs away from the World Series the season prior. Rollins’ comments were not taken particularly seriously until the Phillies swept the Mets in a four-game set in August in Philly and then again in a three-game set in September at Shea. The Phillies would erase a seven game Mets lead with 17 to play and win their first NL East title since 1993, in large part to Rollins’ MVP season. Rollins became on the second Phillie ever to hit 30 HR and steal 30 bags in a season in 2007 and has been the club’s undisputed greatest shortstop. Rollins leads all Phillies’ shortstops in HR, runs scored, RBI, SB, SLG, and OPS and ranks third in BA and seventh in OBP. In club history, Rollins ranks second in games played, PA, and steals, tenth in HR, third in runs scored and eighth in RBI. Including the historic 2007 squad, Rollins was the starting shortstop on each of the five NL East winners from 2007 through 2011. Rollins was a .250/.314/.372 hitter in the playoffs, including three homers. Rollins most memorable postseason hits include a Game 5 lead-off homer against Chad Billingsley in the 2008 NLCS and his two run, game-winning double in Game 4 of the 2009 off of Jonathan Broxton to help put the Phillies up three-games-to-one en route to their second straight pennant. From 2000 through 2013, Rollins played the most games at shortstop, stole the most bases, and hit the most doubles while trailing only Derek Jeter in fWAR and runs scored, Miguel Tejada in HR, Jeter and Tejada in RBI, and Jose Reyes in triples. Rollins also played stellar defense, leading all MLB shortstops in defensive runs saved according to FanGraphs’ version of the stat during that time period as well as having the third-best fielding percentage at shortstop of all-time. As Rollins continues to add to his career totals, he not only will catch more Phillies but he will also join the rare air of the elite shortstops. Rollins ranks eighth in homers among shortstops, 18th in runs scored, and tenth in steals. Rollins is now the second-most tenured Phillie of all-time, has won an MVP, is a multiple-time All-Star and Gold Glove winner, and was part of the 2008 Championship squad. For this, he is ranked ninth on the Phillies Nation Top 100 Countdown.